Trees that have corrective pruning when they are younger have fewer defects when mature, are less likely to fail or drop branches, and of course the cost is much cheaper to prune a young tree than it is to correct a large defect on a mature tree, or clean up after a storm break. The goal in training young trees is to establish a strong trunk with sturdy, well-spaced branches. 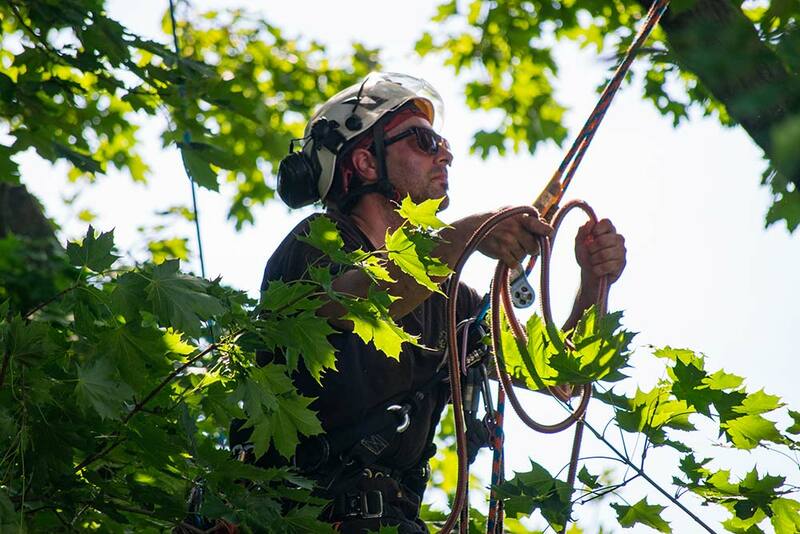 Good tree pruning removes structurally weak limbs while keeping good form. With most young trees the idea is to maintain a single dominant ‘leader’ or central upright stem. Do not prune back the tip of this leader. Sometimes a tree will develop double leaders known as co-dominant stems. 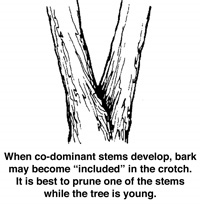 Co-dominant stems often lead to weakness and failure, so it’s best to remove one stem while the tree is young. Some trees have a tendency to develop these branches with narrow angles of attachment. As the tree grows, bark becomes enclosed in the crotch between the branch and the trunk. This growth is called included bark and weakens the attachment of the branch to the trunk leading to branch failure when the tree matures. 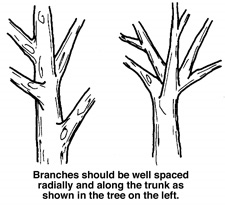 You should prune branches with weak attachments while they are young. As a rule side limbs should be no bigger than 50% of the main stem. If they increase in size they can form long, large horizontal limbs such as often seen on silver maples, leading to limb breaks and/or expensive and extensive pruning when mature. New trees often have low branches that give trees a nice shape when young, but low branches are usually inappropriate in urban areas. The height of the lowest permanent branch is determined by the tree’s function and location. Trees that are used as a screen or windbreak may have lower limbs. Most large-growing trees are eventually pruned to allow head clearance. Avoid over-thinning the interior of the tree. A good rule of thumb is to maintain at least half the foliage on branches arising in the lower two-thirds of the tree. Similarly, heavy crown raising of trees, above 50% crown to stem ratio, can lead to top heavy growth, leaving the tree open to wind damage. The left style of pruning will help the tree to resist breaking in winds by producing a ‘damping’ effect throughout the crown. Essentially the tree acts like a shock absorber. Long limbs with foliage only higher up or heavily raised trees essentially have only the stem or long length of limb to take all the shock, and often break or fail at the roots.